Home »Uncategorized»Just Keep Worshipping ! I’m continuing the idea from my last blog on worship! Do you realize worship has the ability to literally change the atmosphere around us? It starts by changing our own heart and then flows out and impacts others. Again looking at the story of Paul and Silas in Acts 16 we read in verse 25 the other prisoners were listening as they brought a sacrifice of praise while sitting in that dark, stinky dungeon. I wonder what the other prisoners were thinking. Shocked these two men could muster up gratitude while in their current condition, likely. Wow! Their worship impacted the very ground under the prison, and ALL listening to them. Why did not one prisoner flee when they had the chance? My guess is there were some pretty bad dudes in that prison, who had committed real crimes, not there on trumped up charges like Paul and Silas. No doubt some were facing execution. Yet, NONE of them leaves when the opportunity presented itself?? I believe as the prisoners were listening to the singing and prayers of Paul & Silas, the Holy Spirit was working on their hearts. We don’t know how many prisoners became followers of Christ but we know the jailer along with his entire household received the gift of Christ and were baptized. I have to let this all sink in. Paul and Silas chose to worship the Lord in the worst of circumstances; without knowing things would change for them anytime soon. What if they had responded the way I most likely would respond? Complained, cried, and screamed out at the Lord, “Are you serious! I’m doing your work and you allow this to happen? You care so little for me you don’t step in and prevent this? I’m in pain, I’m stinky, I’m so angry with you!” If that were how they responded, no one would have blamed them. It’s the expected response. The reaction that would have impacted NO one! However, because they responded in a way that caught the others off guard, their ears were perked up. “Are those men singing? 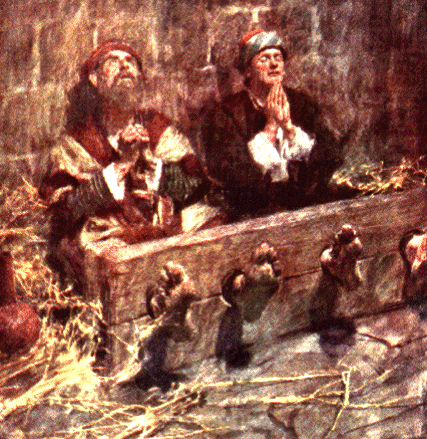 Their bodies bruised and bloody, their feet in stocks and they’re singing to their God?” I believe as the other prisoners opened up their ears their hearts were softened to the work of the Holy Spirit. The jailer himself is so touched by Paul & Silas’ integrity, he brought them to his homes, cleaned their wounds and fed them. When we worship regardless of our circumstances or our feelings; the atmosphere within us and around us changes. We may not see it right away as Paul and Silas did in that instance, but we will see it. How do you respond when things go south in your day? Or when stress rises up in your ministry? What’s your first reaction when plans which seemed like such good adventures fall apart? What would it take for you to make praise your first response in the difficult moments in life? ← Previous Previous post: Just Worship! Next → Next post: Courageous Leadership!